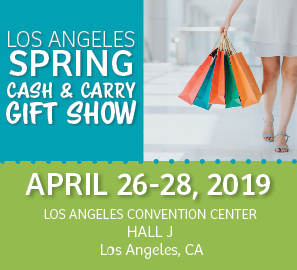 Introducing the NEW Los Angeles Spring Cash & Carry Show! This new spring show will be held at the Los Angeles Convention Center, South Hall J from April 26-28, 2019. Expect to see a vast and versatile collection of gifts to go. Featuring the best selection in the west, you'll be sure to find exactly what you're looking for! To register as a buyer, be sure to visit our Attendee Registration page.